During the Kristallnacht memorial service at Temple Sholom Friday evening Cantor Laura Breznick and Rabbi Ari Rosenberg get ready for the candle blessings. This November marks the 80th anniversary of Kristallnacht. NEW MILFORD — As a Jewish girl in 1930s Germany, Susi Leiter quickly learned a knock on the door or the shuffle of boots outside was never a good sign. The dreaded knock came with a shattering of glass at midnight on Nov. 9, 1938, when the Gestapo arrived to arrest her family. They were herded onto a truck with other Jewish families and kept in a dark chamber at the local jail. Leiter said it could have been days, weeks or months that she and her mother were separated from her father. Leiter, 92, a Holocaust survivor who lives in Sherman, shared her story during a memorial service at Temple Sholom in New Milford on Friday, commemorating the 80th anniversary of Kristallnacht and honoring the 6 million Jews killed during the Holocaust, or about two-thirds of the the Jews in Europe at the time. She lost 27 relatives in concentration camps during the war, including her brother. She was only one of three in her family to escape to the U.S., arriving here when she was 14 after 2 1/2 years hiding in France. Her parents had papers to leave because a high school friend of her father’s was willing to sponsor the family in the U.S. But after being smuggled to the American embassy in a friend’s moving truck, they learned Leiter wouldn’t be able to get a visa because she was adopted. Instead, her father arranged for her to be brought to France through a Jewish underground organization. She moved to several different detention camps while in France, staying mostly in air raid shelters because the Nazis were bombing Paris daily. At the camps, the 2,000 or so children looked after each other, crying for their parents and then crying for each other. “We became the nearest thing to a family,” she said. Of those children, only she and another were able to reconnect with their parents through the French kinder transports, far less successful than the English operations of the same name. 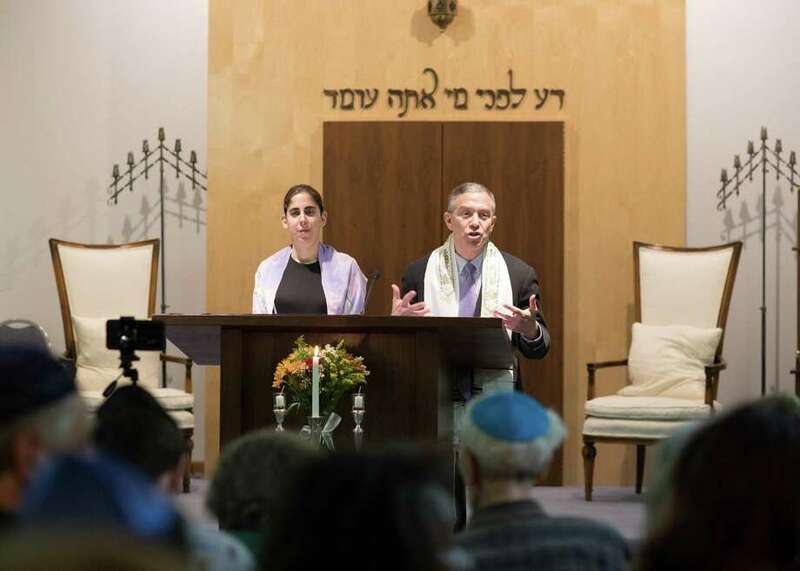 Leiter’s story was especially poignant following the Oct. 27 shooting at the Tree of Life Synagogue in Pittsburgh that killed 11 people, making it what is believed to be the deadliest attack on Jews in the history of the U.S.
“We look at our history and ask if this is how it begins,” Rabbi Ari Rosenberg said. But both he and Leiter acknowledged that America in 2018 is not the same as Nazi Germany as Kristallnacht was carried out by the government and supported by the people. Still, they said they were worried by the increase in anti-Semitic incidents in the United States. She said anti-Semitism steadily increased in Germany during the 1930s, with ugly caricatures of Jews depicted in newspapers. She wasn’t allowed to wear braided pigtails or participate in the military parades at school with the other girls. She remembers it escalated to “J” being written on Jewish businesses to deter people from going there, isolating the Jews. Then came Kristallnacht. Rosenberg said it’s important to honor the memory of the Jews killed by the Nazis and show the world that they will never abide by this again. “We must never forget the Holocaust,” he said.